I love it when I walk out of an eatery satisfied. Today was one of those days. 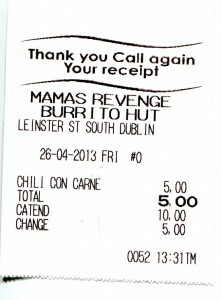 I followed my own suggestion in my last posting and went to Mama’s Revenge (the link leads to their Facebook page), a small(ish) ‘burrito hut’ (that’s what it says outside) on South Leinster Street. To answer the obvious question, South Leinster Street is the continuation of Nassau Street, running from the junction with Kildare Street to Lincoln Place, opposite TCD’s railings. 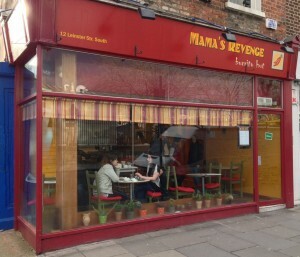 Mama’s Revenge is on two levels: the ground floor comprises the kitchen, serving area and three two-place tables while downstairs there is a collection of different size tables in a sizeable room, seating about 25-30. It’s clean, bright and yellowy-orange. The menu options are laid out clearly on a board behind the serving area and there’s plenty of choice, even for a fiver. Click to embiggen. Go back to return. If you’re a student, there’s even more choice. They do ask you to show your student card, by the way, if you order one of the student offers. I was there at about 1.30pm and there was a steady stream of customers, mostly ordering food to take away. I had a look downstairs when I was leaving and it was about a quarter full. Anna, from behind the counter, who I spoke to told me that it had been very busy between 11.30 and 12.30. I ordered a chili con carne. 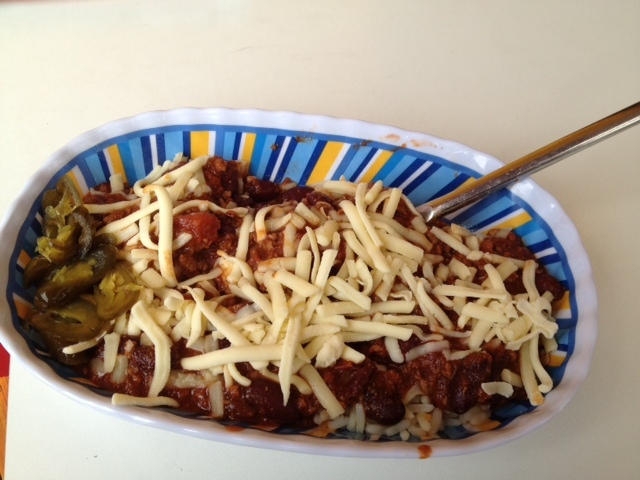 A generous portion of chili con carne was spooned over a couple of spoonfuls of rice. Grated cheese and jalapeños were offered, both of which I accepted. I grabbed a spoon, paid over my fiver and found a seat by the window. The rice was nicely cooked and firm. The chili was tasty, tomatoey, and meaty, with kidney beans and a moderate amount of chili heat. Extra heat was supplied by the jalapeños. 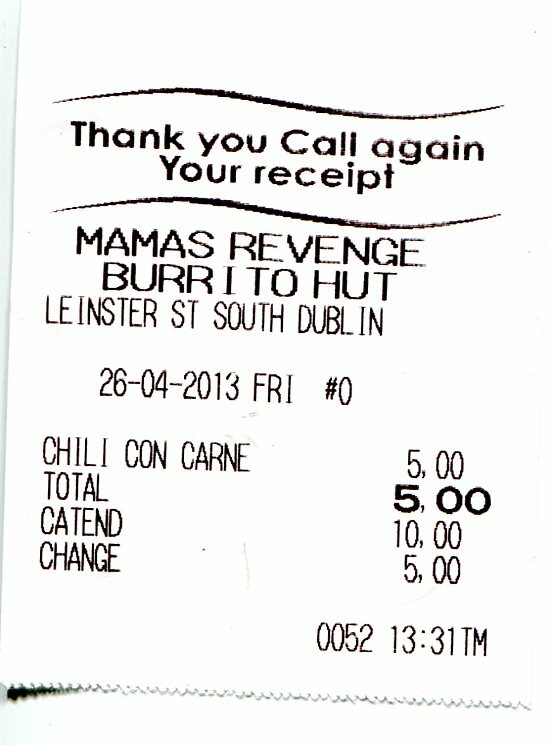 The food was tasty and filling and, I felt, pretty good value for my fiver. My only criticism is that it wasn’t hot (temperature-wise). That doesn’t bother me much, to be honest. I’m not a fan of high temperature food but it would bother some people. I’m sure, however, that they would have heated it up a bit more had I asked. 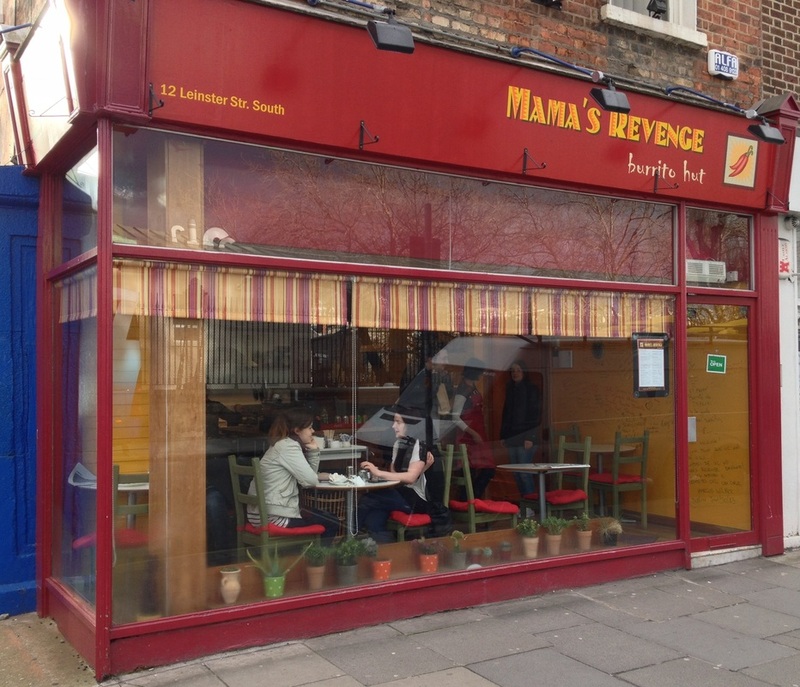 Anna told me that Mama’s Revenge has been open in South Leinster Street for about a year and that, more recently, another branch had opened on Thomas Street, near the National College of Art and Design. It gets mad busy at lunchtime so, if you want a more leisurely Tex-Mex experience, Anna suggests that you come after 2pm. 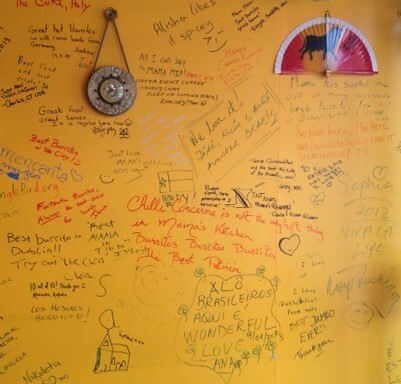 It has a wall on which people have written things. Apparently the wall in the Thomas Street branch is more arty, as one might expect. I liked Mama’s Revenge. Good atmosphere, pleasant service, nice food and plenty of choice for your fiver. I’m going to try their other branch and I’ll return to this one too, maybe with a companion. I’d say it’s definitely worth a shot. By the way, eatforafiver.com has almost doubled in value in the last three months. It’s now worth $22. Yay!